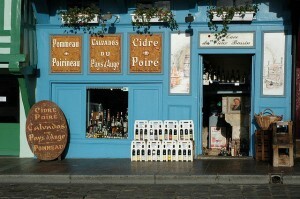 Cider or cidre is the local drink of Brittany. Cidre Doux is the sweeter of the ciders, and Cidre Brut is dry stronger cider. Traditionally it is served in ceramic bowls rather than glasses and are often accompanied by another favorite and traditional dish of crepes. A crepe is a type of thin pancake made from wheat flour and are served with a variety of fillings including ham, eggs and cheese. They can also be eaten sweet as a desert. Feeling hungry? Here is a simple recipe to make your own French Crepes.